Ear blockage refers to the feeling of stuffiness or congestion which is most likely to occur either due to inflammation or a blockage in the eustachian tubes (tubes that connect the middle ear to the back of the throat) of the ear. 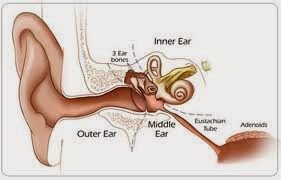 The eustachian tubes are basically concerned with the drainage of fluids and regulation of pressure; and when blocked, they can lead to pain or even slight hearing loss. Common Causes of Ear Blockage- Most commonly, ear blockage arises as a result of congestion from a cold, which lead to blockage of the Eustachian tubes with mucus. Sometimes, ear blockages may also occur as a result of bacterial infection which causes inflammation within the ear canal, which thereby blocks the ear passages. Other common reasons for ear blockage are changes in air pressures during a flight and excessive wax in the ear. In rare cases, ear blockages are also observed when a person is intolerant to lactose. Home Remedies for Ear Blockage- Treating ear blockages isn’t that difficult, you can do it with these simple home remedies. Soften it! If its hardened wax that’s causing your ear blockage, try softening it- use an eyedropper to let a few drops of mineral oil or baby oil into the opening of your ear; do this for 3-4 days-this will cause the hardened wax to get soft, making it easy to be removed using a earbud. Always consult a doctor before you put anything into your ears! Also, NEVER attempt to dig out hardened wax using sharp or pointed objects like a pen, pencil, hairpin etc. This action tends to push the earwax harder and deeper into the ear, and can cause serious damage to the inner delicate linings of the ear. Try ‘hot’ foods- If you are sure that your ear congestion is due to cold, you can try eating ‘hot’ foods like garlic, onions, radish, jalapeno, pepper, chillies etc to clear the congestion. These foods tend to soften the mucus that’s blocking the ear, and thereby reduce congestion. Drinking warm soups, broths and a cup of tea can help too! Chew gum- Yes, you read it right! Chewing on sugar-free gums or lozenges can help relieve ear blockages experienced during a flight. Inhale! It is believed that steam inhalation, preferably with a few drops of peppermint, eucalyptus or lavender oil, can help curb ear congestion. Do it manually! Yet another effective home remedy to cure an ear blockage is to simply stretch the back of your throat-this encourages the eustachian tubes to open up, relieving congestion. You could also try shutting your mouth while exhaling gently as this helps build up a gentle pressure on the eustachian tubes, forcing them to open up and relieve the block.